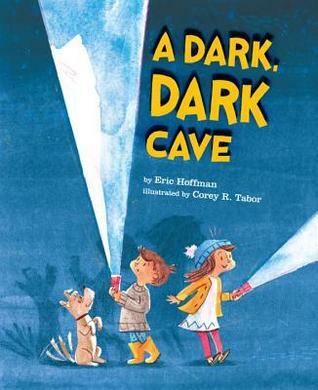 The Michigan Library Association (MLA) is pleased to announce A Dark, Dark Cave by Eric Hoffman and illustrated by Corey R. Tabor, published 2016 by Viking Books for Young Readers, is the winner of the 2017 MLA Mitten Award. In A Dark, Dark Cave, a sister and younger brother and their tail-wagging dog descend into the depths of a dark, dark cave leaving a pale moon shining behind. With flashlight beams leading the way, they discover fluttering bats, rock formations, creepy-crawlies, and huge glowing eyes. Exploration reaches its climax when paws reach out and a huge shadowy figure appears in the cave's entrance. "That's too loud, kids. Find a quiet game. The baby's sleeping." Expressing exuberant creativity, the two siblings happily resume playing "in what used to be a dark, dark cave." Eric Hoffman has worked for thirty-five years in Maryland, Ohio, and California helping preschoolers create caves, forts, nests, barns, and other hideouts. Some of his works include Best Best Colors, Heroines and Heroes and Play Lady. In addition to his own books, his work with young children is featured in the book and video Starting Small, part of the Southern Poverty Law Center's Teaching Tolerance Project. He lives and writes in a sunny house in Santa Cruz. Corey Tabor is the author and illustrator of Fox and the Jumping Contest and the illustrator of A Dark, Dark Cave. He creates his illustrations with pencil and watercolor and a dose of digital wizardry. Corey lives in Seattle with his lovely wife and spends his time making pictures and stories. The Mitten Award, established in 1999, is designed “to recognize and promote quality literature for youth in picture book format, and the ability to communicate to that audience through literature.” The award selection work group is comprised of Michigan librarians who consider hundreds of children’s books annually to determine a winner.